I drafted the following section of testimony by Jennifer Davis outlines the case. Mr. Chairman, as I conclude I would like to discuss briefly three specific issues concerning the situation in South Africa and U.S. policy toward the region. First I want to raise the serious case of U.S. arms and ammunition being sent to South Africa. Second I would like to urge that Embassy Personnel be encouraged to play a more active, and public role in visiting areas of South Africa that have experienced serious violence. Third, I want to encourage the Senate to act on Senate Resolution 301. Mr. Chairman, at the same time as violence is taking its grim toll in South Africa, American-made shotguns and ammunition worth millions of dollars have been illegally going to South Africa, in violation of the arms embargo. It is likely that some of these guns have been used to kill men and women active in the struggle for democracy. I have attached to this testimony a clip from The Citizen newspaper of May 15, 1992 describing how a Mossberg weapon was found in the possession of a KwaZulu policeman arrested in Natal. U.S. export licenses were granted for these weapons on the basis of fraudulent assertions that they were going to countries that border South Africa. One can only conclude that U.S. officials were asleep at the switch. Orders for Zimbabwe were faxed from South Africa. Licenses were granted even when no supporting documentation accompanied the application. And now it appears that jurisdictional infighting is seriously impeding investigation of these violations. The Africa Fund first alerted the Departments of State and Commerce to a series of these cases in November 1990. In June, 1991, forced by the Commerce Department’s persistent stone walling, we filed a Freedom of Information request with the Department of Commerce for the export documents. When this was denied, we filed suit in federal court in cooperation with the Center for Constitutional Rights to force disclosure of the export documents. Until this suit reached the discovery stage, the Commerce Department refused even to admit that the documents existed. While now admitting the existence of some 1,100 documents, Commerce continues to refuse us access. This September 14, government attorneys told Federal District Court Judge John Keenan that illness had prevented two Department of Commerce investigators from traveling to southern Africa. At that point we presented the Court with a series of U.S. government cables and faxes provided to us by an anonymous source. These show the investigation fell victim to jurisdictional wrangling and that the Department of Customs opposed the visit of Commerce investigators. The documents also show the extent of the fraud involved. Two of the cables deal with the case of Tatos Brothers. A cable from the U.S. Embassy in Zimbabwe dated June 1991 says that an official of Tatos Brothers in Zimbabwe reported that Fred Tatos, a former owner, was no longer associated with Tatos Brothers in Zimbabwe. He said that Fred Tatos was now living in Cape Town, and denied placing the two orders in question. The cable concludes “IN NEITHER CASE DOES IT SEEM LIKELY THAT THE ORDERS WERE INTENDED TO ENTER ZIMBABWE.” Another cable, dated July 1991, from then Deputy Secretary of State Lawrence Eagleburger, examines all licenses for Tatos Brothers in Zimbabwe. Eagleburger states that total value of the 13 licenses to export defense articles to Tatos Brothers is $1.6 million and that “ALL APPEAR TO BE FRAUDULENT.” It seems likely that Fred Tatos set up a office in Cape Town and placed the orders pretending they were for Tatos Brothers in Zimbabwe. In a number of cases cited by Eagleburger the original orders were even faxed from South Africa. In one typical case Eagleburger notes “NO SUPPORTING DOCUMENTATION ACCOMPANIED THIS APPLICATION BUT THE LICENSE WAS ISSUED ON 8 NOVEMBER 1990.” Clearly, no one in Washington was paying much attention to these applications. The claims that a good faith investigation is underway appear to be flimsy. Unfortunately, Mr. Chairman, we have been forced to the conclusion that this administration cannot be trusted to reveal the truth about these arms shipments, much less put an end to them. That is why I am urging this Committee to subpoena the 1,100 documents relating to illegal munitions shipments to southern Africa. It is also necessary to ensure that the Commerce and State Departments finally begin to enforce the law and end this traffic in death. I urge this Committee to closely monitor efforts in this direction in the weeks and months ahead. It seems on the face of it a bad policy to allow transshipment of embargoed items through an embargoed country. The possibility of diversion is too great. The Department of Commerce should cease granting licenses for transshipment of guns and munitions through South Africa. One final intriguing note. According to the Weekly Mail (September 18), Fred Tatos is currently working for a Cape Town based company called Suburban Guns. 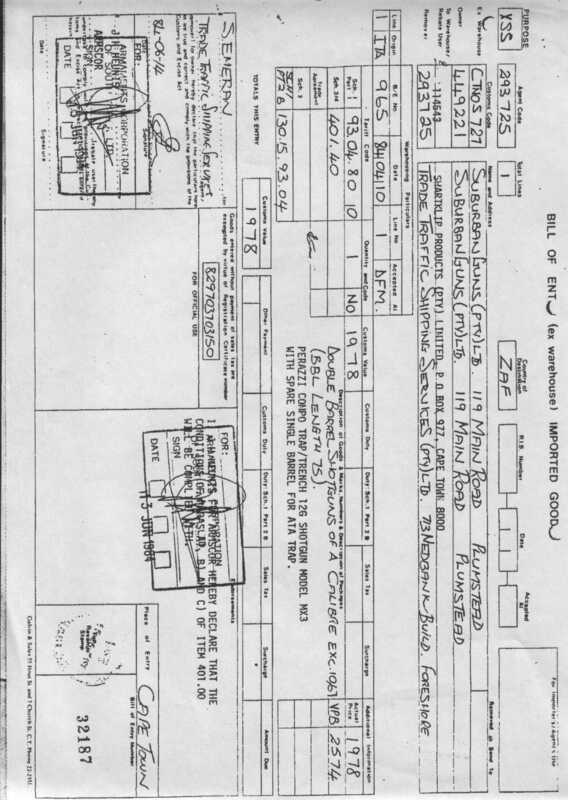 The Mail has supplied us with a copy of a 1984 South African import document for Suburban Guns for shotguns that was signed by Armscor, the government-owned armaments company. DOCUMENTS in The Weekly Mail’s possession have revealed a huge illegal trade in weapons from the United States to South Africa — and there are fears that many of these arms may have found their way to war-torn Natal. The Africa Fund, a US anti-apartheid pressure group, has started a civil action in New York against the US Department of Commerce. It wants the courts to force the department to release more than 1 000 pages of documents detailing illegal arm transactions. The documents, outlining some of these transactions, reveal that hundreds of semi-automatic pistols, revolvers, rifles, magazines and hundreds of thousands of rounds-of ammunition, worth millions of dollars, left the US but never arrived at their stated destination of Harare, Zimbabwe. The weapons were to have been shipped via Cape Town. US law and the 1977 United Nations arms embargo still forbid the export of military arms to South Africa. In the US, the export of weapons with civilian uses is governed by federal controls. US district attorney Peter Sobol, who is investigating possible charges against US companies, says some munitions did not arrive at the destination stated on their export licences or were transferred to South Africa after their arrival at their destination. The Commerce Department’s investigation covers the period from 1972 to the present, and is being conducted both in the US and southern Africa. “The documents we’re investigating are cumbersome. It takes weeks and months to verify. The investigation is national and international. It just takes time,” Sobol said. Accusing the Department of Commerce of not taking the arms embargo seriously and of trying to cover up lax licensing procedures allowing the munitions through in the first place, The Africa Fund has demanded that it be allowed to examine the documents. Africa Fund members are incensed that the arms may have reached South Africa, especially since shotguns, made by US companies, are reported to be used in violence in the South Africa’s townships. On May 14, this year, a sergeant in the KwaZulu Police, Siphiwe Mvuyane, was arrested by members of the South African Police in connection with an arms cache which included a shotgun made by the US gun manufacturer Mossberg and Sons of Connecticut. Although the importing of over 50 tons of munitions was spread over four years, it is the large quantity of weapons involved which has served to harden suspicious that the weapons have been used to fuel the violence In the South Africa. According to the manager of A Rosenthal, a gun dealership whose export licence was revoked by the US Commerce Department, small private concerns could not be responsible for arms trading on any large scale. “There is just no way they could finance it,” he explained. According to The Weekly Mail’s documents, most of the munition orders were placed by a Harare-based firm, Tatos Brothers. A director of the company, Dhiru Desai, has denied placing at least two of the orders and said that his company has not received a foreign currency allocation, from the Zimbabwean government, to import munitions for several years. The US State Department, which as responsible for the investigation in southern Africa, is looking into a possible link between a former owner of the company, Fred Tatos, and the false orders. Tatos, now based in Cape Town, works at a gunshop, Suburban Guns. Earlier this year, Suburban Guns was named in documents revealing how private concerns purchased arms, ammunition and chemicals for Armscor. A South African Bill of Entry was appended to the testimony. The documents list the imported items as "Double Barrel Shotguns" destined for Suburban Guns (Pty.) Ltd. of Cape Town and are signed by Armscor, the South African government's armaments corporation. You can view this document as a jpg file.